In the labor song “59 Cents”, one line stands out: “Your paycheck’s not for extras, it’s for staying alive!” How often do we forget the discrepancy between wages for men and women! The Bureau of Labor Statistics published their recent findings that remind us of this inequality. 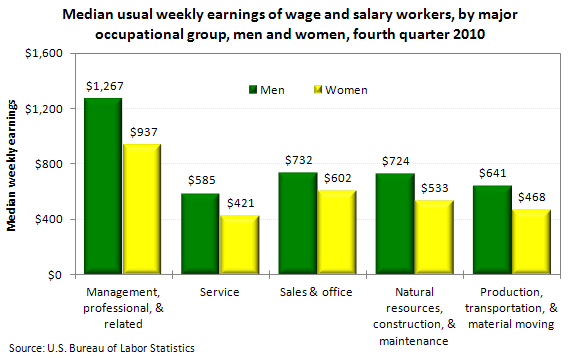 Men who were employed full time in management, professional, and related occupations in fourth quarter 2010 had the highest median weekly earnings, $1,267, compared with $937 for women in those occupations. Men and women who worked in service jobs earned the least, $585 and $421, respectively. The imbalance seems particularly glaring when considering lesser-paid jobs where the extra $164 that men receive every week represents a huge percentage of the overall salary. When considering the data from all full-time professions, the median weekly earnings of women is 81.8% of men. The female-to-male earnings ratio varied by race and ethnicity. White women earned 81.1 percent of their male counterparts, compared with black (96.2 percent), Asian (75.9 percent), and Hispanic women (89.9 percent). What does the narrow economic gap between black men and women suggest? Does it mean that black women have done uniquely well in overcoming sexism or that black men face particularly extreme discrimination? How does your company measure up? Does your company offer equal pay for equal positions? The information below invites further analysis.